BUON NATALE e un nuovo anno pieno di idee !!! Un grande baccione -Mihaela. What a wonderful honor! I can't imagine the excitement of being chosen and then spending time at the White House with Mrs. Bush. Your photos are wonderful and I know you will cherish them forever. Oh Celeste... I cannot even imagine what that would be like, what a wonderful honor for you!...and to have the love of your life and best friend Larry there with you is so exciting!...you look just beautiful in every photo... I love the beautiful buffet table, and also love the dishes of former presidents. The picture of Lady Bird Johnson is exquisite in the powder room... and how cute, Larry said he used the potty in the White House! That gingerbread house was so fun to see... your drum ornament is just precious! You are so talented my friend, it is no wonder they wanted to include you! I can't believe how many themed ornaments you created!... I also love seeing the WWII Memorial, and the photo of you with the WWI Vets from your daddy's home state of Pennsylvania... these things touch my heart so, and of course your daddy looked down and saw that, and is so very proud of you!... What a precious gift from Laura Bush of the photo of you and Larry with her... she made such a beautiful First Lady!... thank you so much for sharing these incredible photos and most wonderful experiences... you so deserve the recognition for your beautiful creations... much love to you Celeste... and Merry Christmas!... xoxo Julie Marie PS I love the beautiful plate at the first with the barn on it too! Thank you SO much for sharing the photos and story of your visits to the White House. WONDERFUL!!! I especially loved your special note at the end. What an honor - and thanks for sharing!! It was wonderful reading about your journey to the White House! It is an amazing place to visit at any time. So much history has happened in those walls. Love the area and all the things to see. Thanks for sharing your amazing talent with us. Your Dad would be happy that you were selected and got to meet and see the monument that was finally built for the brave men that served in his time. My Dad was one of them. He served in the Phillipines. Have a wonderful Christmas, friend! Beautiful and touching story, sweetpea. I love all our service men who protect our country and our loved ones and your Dad was a great example of that. Thank you for this post! Celestina Marie!!! You are stunning, and Larry handsome. You did yourselves proud. What an honor. I know you will never forget that special time. I love the old cookies cutter.I think the cookies are just fab. Just had to wait till my eyes got dry again for typing... You are above all such a natural, humble person with great talent and above all such a rare inner beauty! No brag letter; nothing like that but you pay respect to this greatest nation in the world in such a special way, together with Larry you represented the best what America has to offer! You sure can be proud and even more so, only six weeks after your Dad left us, only to be there WITH you both. Proudly touching you in order to say some uplifting words to his fellow Veterans, from his home State. This is a legacy that will live far longer than you can imagine. At least, know that we are mighty proud of you!!! What a wonderful post you have shared today and what proud memories you must have of your visits to the White house. What an honour and to have all the fabulous photos to look back on. You are truly beautiful in each photo and you and your husband make such a fabulous couple. You are so very talented and love everything you share. I am so thankful for your beautiful friendship. May you have the best Christmas ever and wish you much joy, love and peace. Celestina , What an honor!! You have some wonderful memories!! Your photos are so beautiful!! Thank you so much for sharing your wonderful visit to the White House! I truly enjoyed the tour of the White House. What a honor to have been in such a magnicifent place. I am a big fan of both President Bush and his whole family. The pictures are beautiful and you look so good!! I also love the pics of WWII Memorial. Thank God for pictures. I am sure you treasure those moments. I can't thank you enough for sharing them with all of us. WISHING YOU AND YOURS A VERY MERRY CHRISTMAS AND A BLESSED NEW YEAR!!! WHat a lovely post Celestina - you should be so proud! What a wonderful thing to have done even once, never mind twice! I stopped by to wish you a Merry Christmas, and what a lovely surprise to read about your amazing artist adventures. I didn't realize you were there twice. Your artwork in the White House. What a wonderful children's book this would be to inspire little artists. Your photographs are gorgeous and so are you. I am sure that your Father was with you in 1998 as you toured the White House, as he and your mom are today. So proud of the most beautiful daughter inside and out. Your life is blessed because you are a blessing. I am proud that I can call you a friend. Wishing you and your family a beautiful Christmas. Celeste, this post brought tears to my eyes...for you and your wonderful experience, and for your opportunity to meet with several WWII vets. And I'm so sorry your Dad passed away just before your invitation. I think he was looking down on you though! Wow, I am in awe! what an amazing honor! Your work is so beautiful and the trip looked amazing! Such gorgeous photos! Thank you so very much for sharing them, it definitely puts me in the Christmas spirit looking at all the beauty! Celeste, I really loved seeing your white house photos from 2004, what an honor that must have been. Keep up the great work and the great attitude as well. I think we could all learn something from your very positive state of mind, I'm know I"m trying to be more like that in my daily life and you have been an inspiration to me in that regard. Have a wonderful Christmas...see you and your artwork in the new year. Every single photo is just awesome. The WH is so fabulously decorated during the Christmas seasons ... a sight I hope that everyone can one day enjoy. Washington, DC, is a city to enjoy all year round, but the Christmas celebrations & decors are magical. New York City is the other sight one should visit at Christmas. What lovely thoughts of/for your precious Father ... his spirit is with you wherever you go. 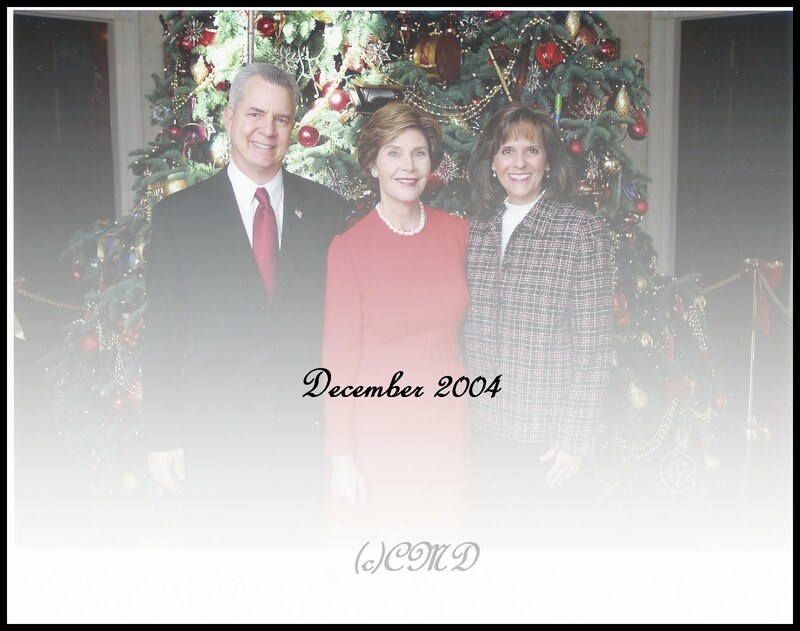 Of course, my favorite pics is you & Larry with our most gorgeous & elegant First Lady, Mrs. Laura Bush. What a handsome couple you & Larry are ... so photogenic. Thank you for a wonderful year of friendship, my precious friend. Have a beautiful & joyous Christmas. You are so amazing and God, no doubt, has blessed you and your family a hundred fold. You never fail to bless and inspire others and in return and I believe that is why you've been incredibly gifted yourself. I love seeing your BEAUTIFUL smiling face and can only hope in 2011 we finally are able to meet in person. AMAZING, AMAZING post Celeste!! What an honor to get to do this. And the memories must be amazing. I just cannot get over this, lol!! The white house always looks so beautiful on tv at Christmastime. I cannot imagine being there in real life! I am happy Larry was able to be there with you! And what you wrote about your dad gave me chills. I KNOW he was there with you and so proud of you!! Hello Celestina: I went to wish Merry Christmas and a Happy New Year. These days, Happiness is installed in your home, you enjoy it with your loved ones, and that 2011 is a year full of wishes made. Hugs, Laura. What a wonderful honor for you to visit the White House and the ornaments you created, how lovely! I love all the photos but reading about your father and his knowing about your being there on the grounds and honoring his fellow veterans really touches my heart. Merry Christmas to you and yours this beautiful day of His birth! Just had to come by and wish you and your family a very happy Christmas. I hope it is filled with the sweetest of blessings. I am so thankful for your beautiful friendship and all that you share. May you enjoy this special time, with those you love. Le mie congratulazioni!!!!! Un caro saluto,Anna. 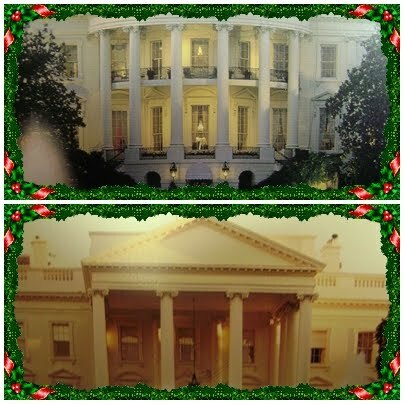 I was also asked to the white house It was when Clinton was in office and we did the 12 day of Christmas. It was with the SDP's I did not go I'm now sorry I did not go .It was so nice to see your trip.Happy Pink Sat. This is so fascinating! What a treasured time in your life! The entire post was beautiful and enlightening. I enjoyed seeing the decor, your personal pics and reading about the trips, but I find the most fascinating information to be the fact that they provided you wth a map of where your ornament was located. Little details I would never have thought about, yet on a tree that large, with that many decorations, I can only imagine that it must be like trying to find a needle in an (evergreen) haystack!